The Minster church of Wimborne stands on the site of a Saxon church attached to an early 8th-century nunnery established by Cuthberga, sister of King Ina. St Cuthburga's nunnery grew to house over 500 nuns and lasted until 1013 when it was destroyed in a Danish raid. St Cuthburga herself was buried in the Saxon church, as was King Ethelred, older brother of Alfred the Great, and a 10th-century Danish king named Sifferth. In 1043 Edward the Confessor founded a college of secular canons on the nunnery site. In 1318 Edward II made the Minster a 'Royal Peculiar', that is, it answered directly to the monarch, not to the diocese. It shared this 'peculiar' status with such important churches as St George's Chapel at Windsor, and Westminster Abbey. The royal peculiar status was revoked in 1846. There are two towers, one rising over the centre of the building and a second, later, tower, at the west end. 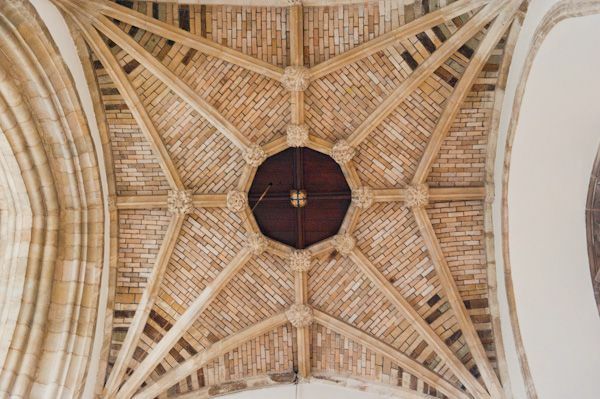 The solidly built central tower was originally topped by a spire, which collapsed during a service in 1600. Miraculously, no one was hurt. Set into the north face of the west tower is one of the Minster's most famous features, a painted statue called Quarter Jack, who strikes the quarter hour on a pair of small bells. Quarter Jack was installed in 1612 and was originally a monk, but during the Napoleonic Wars, he was altered to look like a Grenadier. There are so many fascinating historic features within the Minster it is hard to know where to begin! Perhaps the most famous feature is the Chained Library, located above the choir vestry. The Chained Library was founded in 1686 by Reverend Stone. The Library houses over 400 books, many of them over 300 years old, plus an important collection of church music including a 17th-century organ book. The current bookshop occupies the site of a medieval Consistory Court, where persons accused minor crimes were tried. Beneath the west tower stands the font, with a late Norman bowl on Purbeck marble shafts. Under the tower is a wonderful astronomical clock, dating to the 14th century. 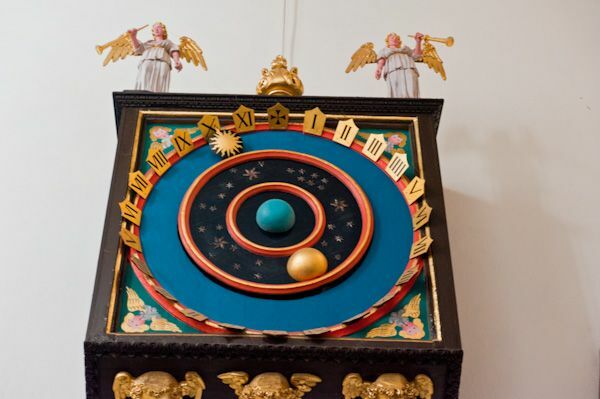 The clock has been recently repainted in rich colours, but the colour scheme is thought to be original. 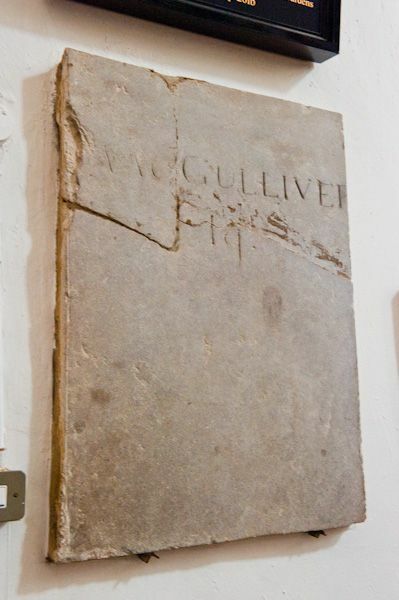 Opposite the clock is the simple memorial to Gulliver, the most notorious smuggler in Dorset. The story goes that Gulliver was eventually pardoned by the king for his life of crime after he disclosed a French plot against the monarch. He then became a respected (and very rich) member of Wimborne society. The central tower is supported on Norman piers, the arches of which are the oldest parts of the church, dating to about 1120. The upper sections of the tower date to the late 12th century. In the north transept are medieval wall paintings, the earliest of which is 13th century. 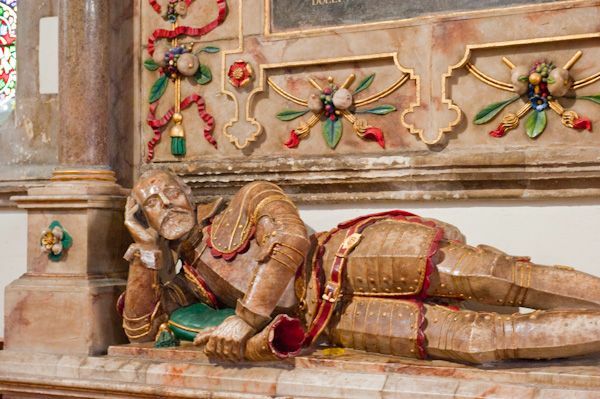 In St George's Chapel is a marvellous memorial to Edmund Uvedale (d. 1606) with the effigy of the deceased painted and gilded in exquisite fashion. Look at his feet; both appear to be left feet! 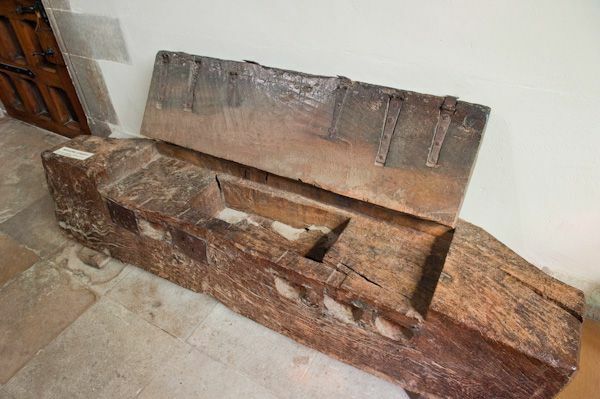 Beside the Uvedale tomb is a remarkable Saxon chest which appears to be made from a single block of wood. This probably held a religious relic. There are two further wooden chests nearby, and an effigy of an unknown Crusader knight. From the chapel a set of stairs lead down to The Crypt, built in 1340. 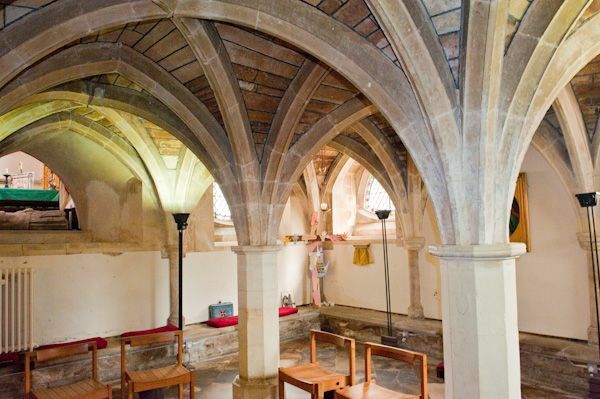 The west part of the Crypt is the burial vault of the Bankes family of Kingston Lacy. Near the High Altar is a small brass to King Ethelred, brother of Alfred the Great, who was buried here after his death in 871. 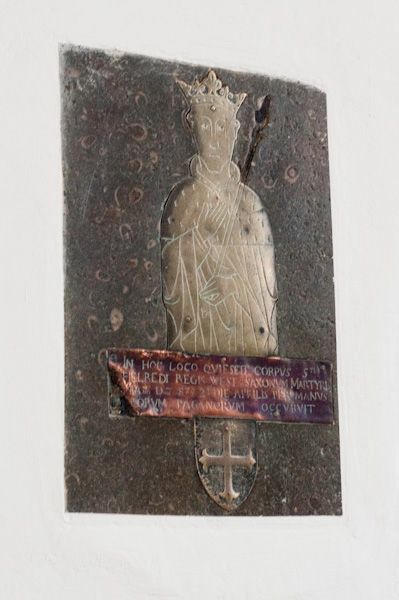 The brass is not original; it was crafted around 1440, and is thought to be the only memorial brass in England to a monarch. 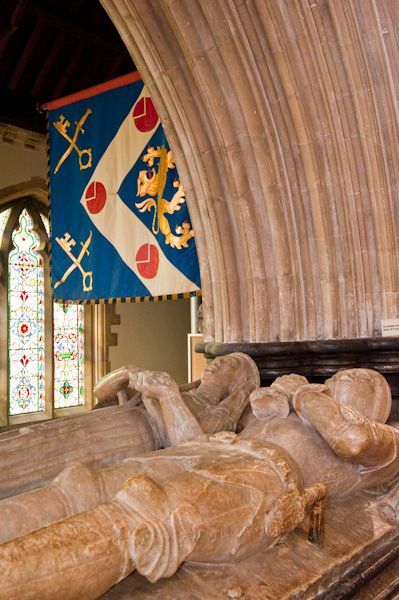 Opposite the brass is the elaborate tomb of John Beaufort, Duke of Somerset, and Margaret Beaufort, his wife. The Beauforts were the grandparents of Henry VII. 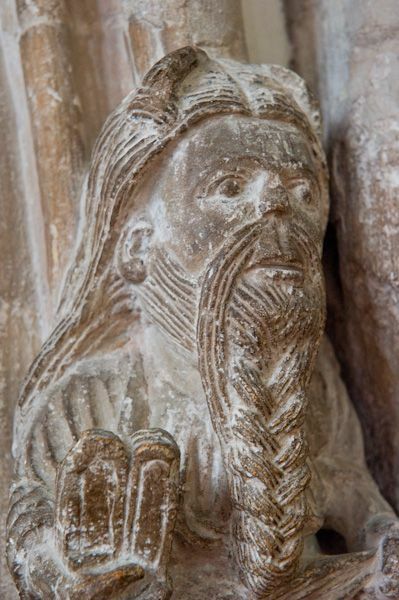 Beside the Beaufort tomb is a famous corbel showing Moses with horns and a plaited beard. The detail on the carving is exceptional. In Holy Trinity Chapel is an ornately decorated wooden coffin to Anthony Ettricke, who tried the Duke of Monmouth after the latter's unsuccessful rebellion. Ettricke was convinced that he would die in 1693, so his coffin bears that date. In fact, he died in 1703, and you can see that the date has been altered in an attempt to reflect the actual date of his death. 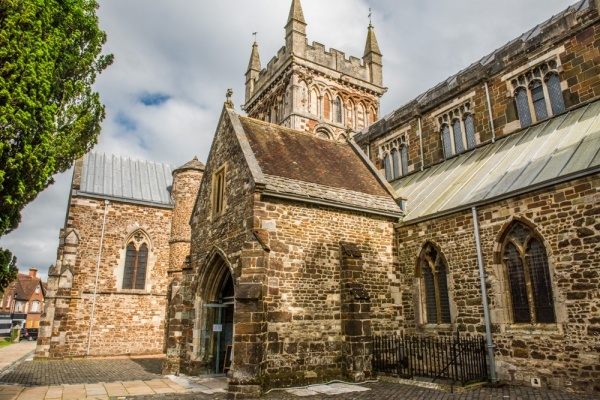 These are just some of the historic highlights of Wimborne Minster, a delightful church, and one that repays a visit many times over. Location: In the town centre. On street parking in the market place and paid parking areas nearby.